Dr. Eran Shadach was born in Israel in November 1961. Until 1996 he served in the IDF armored corps, both during his regular and reserve service, as a platoon commander and as deputy company commander. 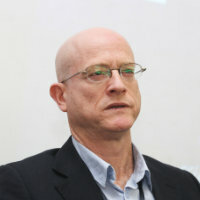 As of 1996 he serves as a psychologist in the IDF "Crisis Management and Negotiation Unit', presently with the rank of lieutenant colonel. In this capacity he specializes in the psychology of crisis management and of negotiation. Since 2001 he is a staff member in the "Program for Training Group Leaders" at the School of Social Work, Tel-Aviv University. In 2002 he was appointed as lecturer in the School of Behavioral Sciences in the Academic College of Tel-Aviv-Yaffo. In addition to his teaching and research he fulfilled several administrative duties. Amongst others, he served several turns as Acting Head of the area of Clinical Psychology and as Acting Dean of the School. As of 2006 he was recognized as a senior clinical psychologist and a clinical supervisor by the Ministry of Health. He subsequently was appointed as the Chief Professional Manager at the 'Reut Institute of Psychotherapy' in Tel-Aviv. He performed research and published papers on topics related to psychopharmacology. His current focus of research is on the psychology of stress and anxiety in academic, in medical, and in conflict situations.